Make decay a thing of the past. We provide specialist paediatric dental treatment in conjunction with state of the art preventive programmes to break the tooth decay cycle. We offer the latest innovations in paediatric dental care utilising the latest research and technology from Australia and overseas. We aim to provide treatment so your child can be cavity free. Because we know that tooth decay is a chronic preventable disease caused by bacteria, we don’t just treat cavities, we treat the disease. No longer is it sufficient to just fill cavities and hope the disease goes away because it won’t. Dr Vivienne Linnett graduated from University of Queensland in 1983. 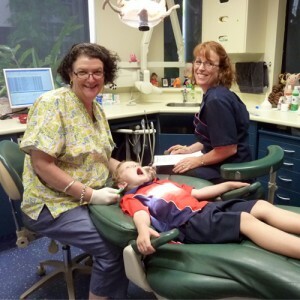 After many years in private practice in regional Queensland and Brisbane, she returned to University to study Paediatric Dentistry for which she had always had a passion. In 2000, she was obtained a Masters in Paediatric Dentistry and has limited her practice to Specialist Dentistry for Children. Dr Vivienne is Brisbane’s most experienced Paediatric Dentist and runs the second Specialist Paediatric Dental Practice to be established in Brisbane. Dr Linnett’s vision for her practice is the promotion of lifelong dental health through the good preventive practices and good nutrition. Dr Linnett has established a dedicated paediatric dental practice designed with kids in mind to provide treatment in a relaxed friendly environment. Dr Linnett has a general dental degree followed by a further 3 years post graduate university training. Like a paediatrician who is a doctor for children, a paediatric dentist is a dentist for children. This additional training focuses on areas such as behaviour management, child growth and development, as well as dental treatment for special needs and medically compromised patients. A Paediatric Dentist has a special interest in children, usually because they like to treat kids. Dr Linnett and her staff enjoy working in a children’s practice, most being mothers themselves. By bringing your child to a Paediatric Dentist, you are giving your child the benefits of being treated by staff who are experienced in treating children and understand the particular problems treating a young child can involve. Most of all, it is of utmost importance that the child becomes comfortable with dental treatment and is not frightened. Good child dental patients become good adult patients with no ongoing fears or phobias about the dentist. Our primary focus, however, is prevention. Regular checkups from around the child’s first birthday can not only ensure the child is relaxed about going to the dentist, but also can prevent a lifetime of dental problems. Your Paediatric Dentist is much more than someone who fills kid’s teeth. She can provide a wealth of information about nutrition and diet, as well as preventive strategies to keep teeth healthy. Many parents are unaware of the impact that some feeding practices have on teeth, for instance prolonged night time breast and bottle feeding, and sweetened drinks. We aim to help your child grow into an adult who is not only free of cavities, but also free of fear of the dentist (unlike many adults now). Contact us for an appointment to show how we can help.